It says something about the world that reporters consider it news to mention when Facebook or Twitter are down for more than a few minutes. 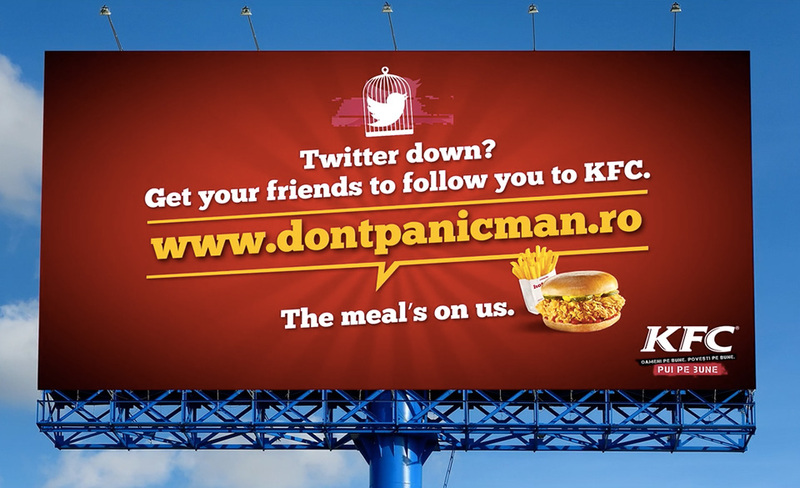 With this in mind, KFC Romania and agency McCann came up with a clever idea: To defray global panic, KFC will offer free food to people whose social networks of choice are down. The principle was simple: For the life of the campaign, visitors to www.dontpanicman.ro could automatically confirm whether sites like Facebook, Twitter, Tinder or Instagram were down. If any of them were, they received a code for a free KFC meal (and an admonishment not to panic). The campaign resportedly boosted KFC attendance by 30 percent during what the brand took to calling "Social Media Outage Days." Per the agency, within the first month, outages on Twitter, Yahoo, iTunes and Tinder resulted in thousands of free meals. That's a lot of meals. We're assuming the objective was to own top-of-mind presence among digital natives whenever their amygdalas go into overdrive—in which case, congratulations! But if the objective was to generate higher sales as demonstrated by actual money, well, that's awkward. Hopefully those thousands of free meals cultivated paid ones down the line, versus, say, a culture of eager (and hungry!) DDOS attackers. Though we concede that would be hilarious.